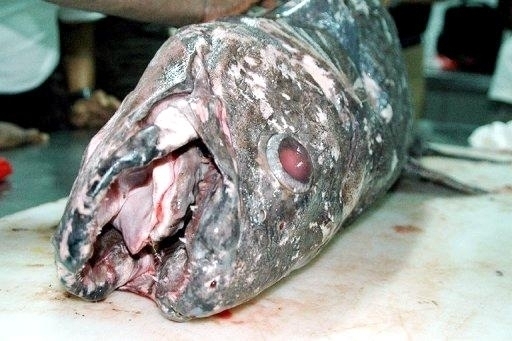 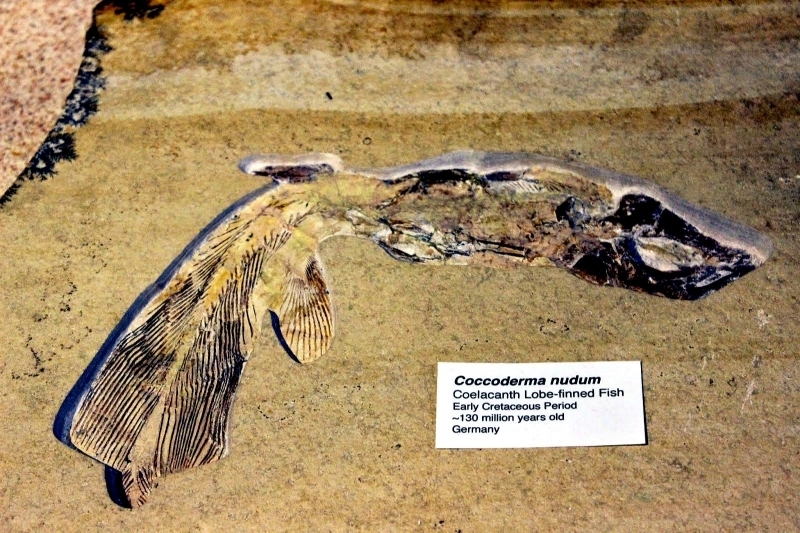 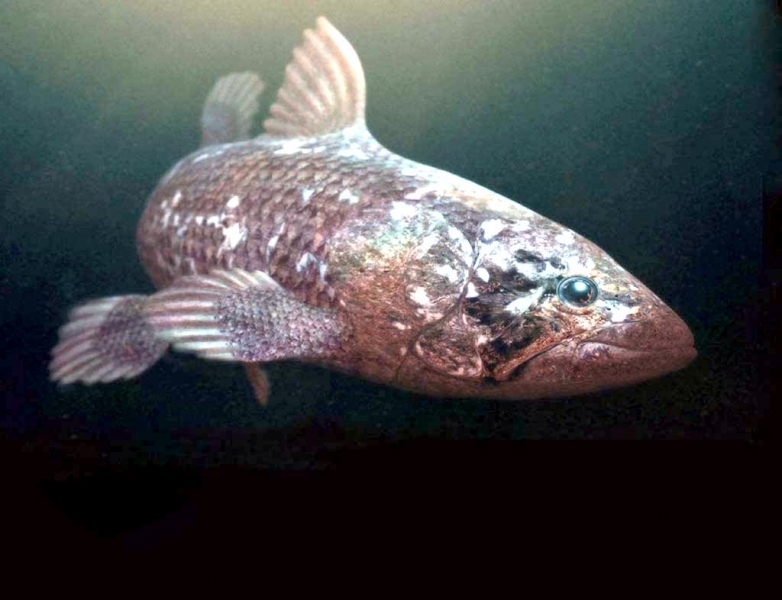 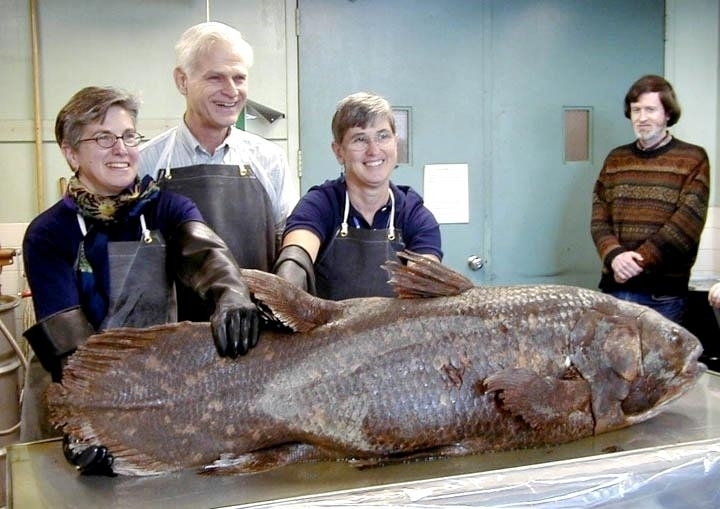 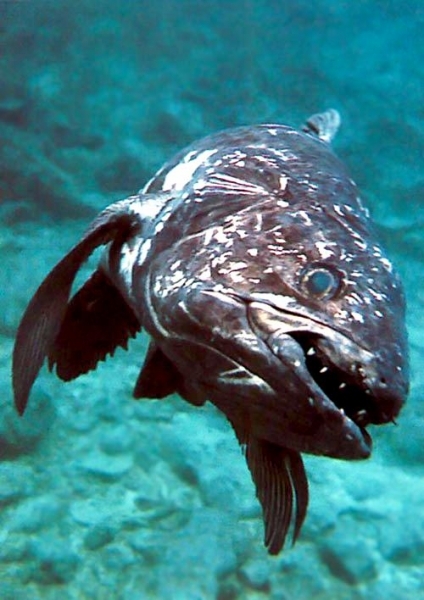 The living Coelacanths (pronounced: “see-la-kanths”) are possibly the sole remaining representative of a once widespread family of Sarcopterygian (fleshy or lobed-finned) Coelacanth fishes. 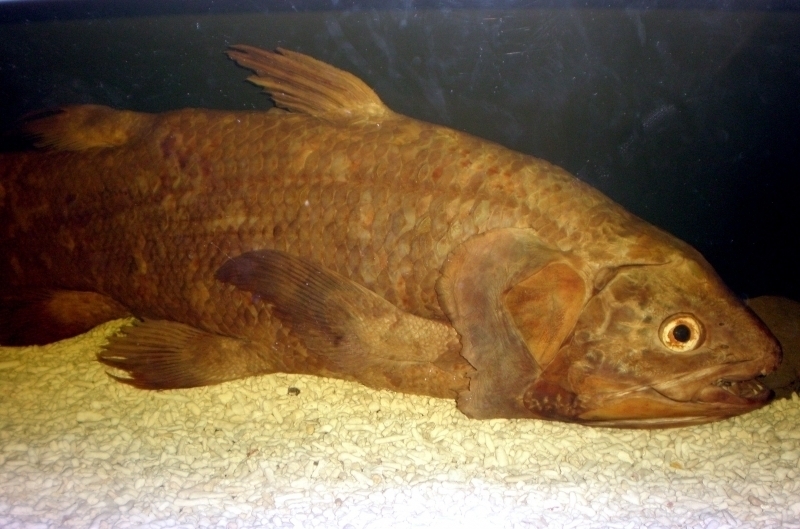 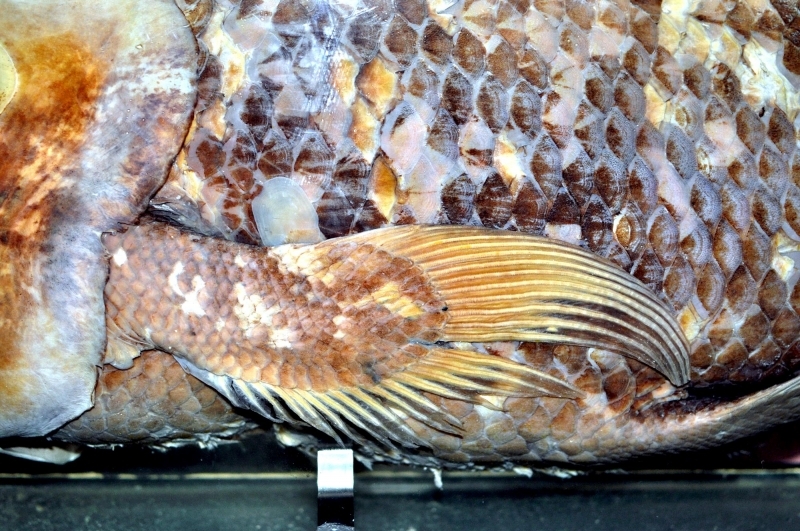 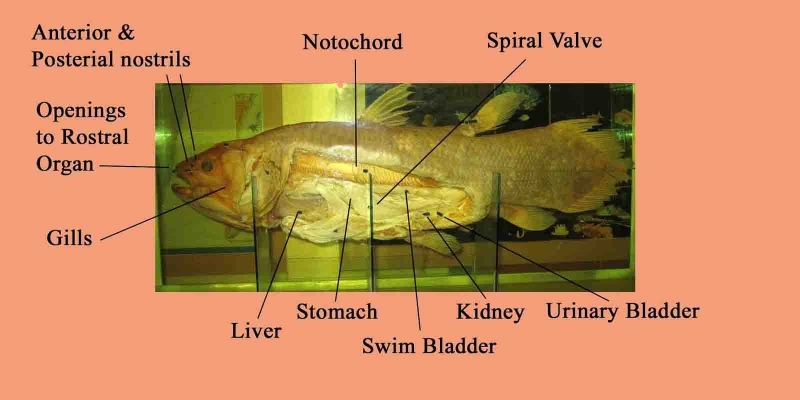 The word “Coelacanth” is derived from the Greek words κοῖλ “hollow” and ἄκανia “spine” for “hollow spine” because of the fish’s unique hollow spine fins. 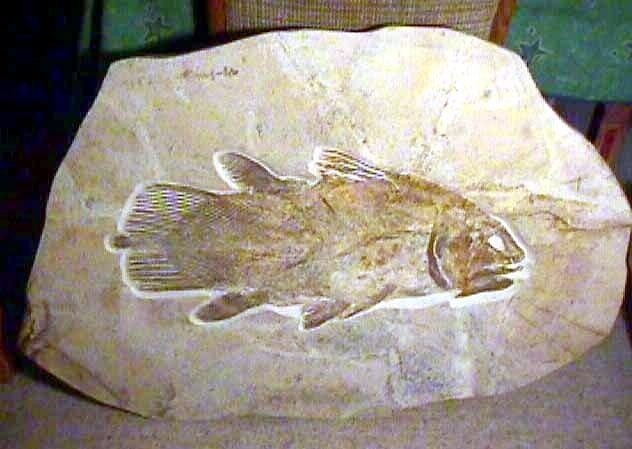 The Coelacanths were thought to have gone extinct during the end of the Cretaceous period 65 million years ago. 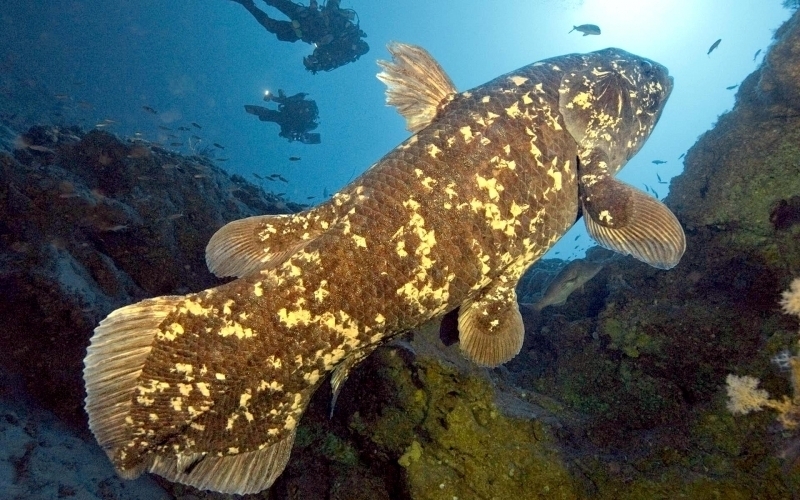 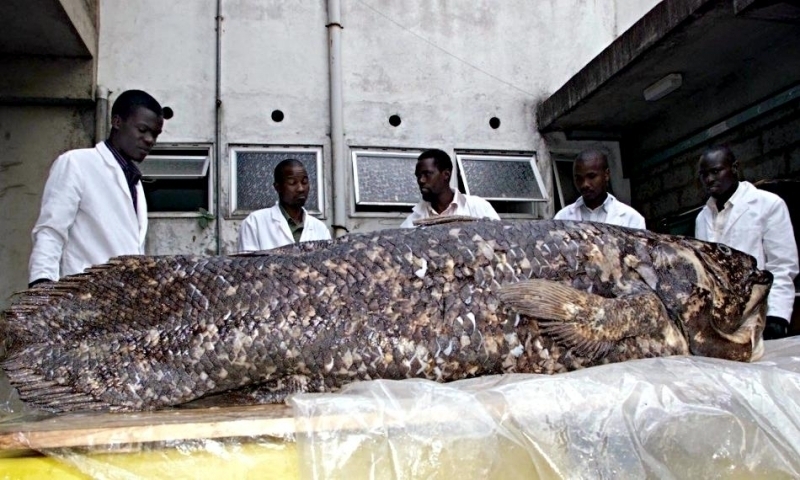 A few days before Christmas in 1938, a Coelacanth was caught at the mouth of the Chalumna River on the east coast of South Africa. 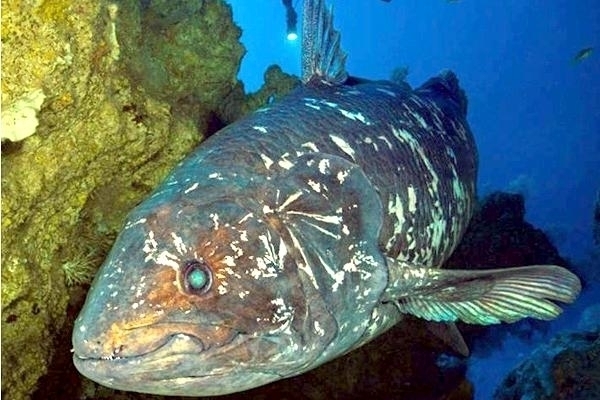 The fish was caught in a shark gill-net by the crew of Captain Jacab Goosen, who had no idea of the significance of the find. 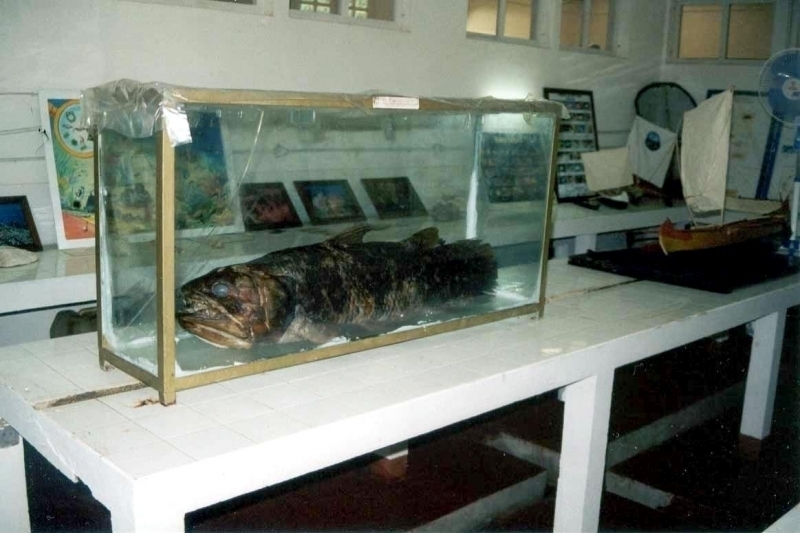 He thought the fish was bizarre enough to alert the local museum in the small South African town of East London. 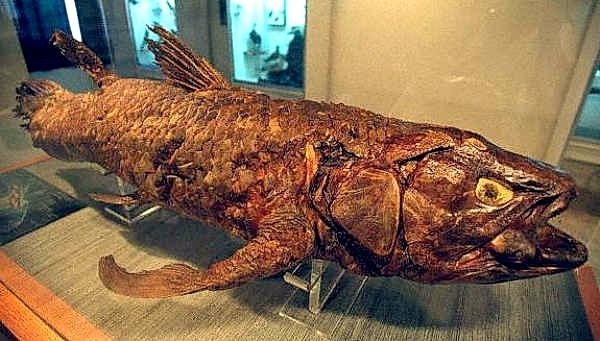 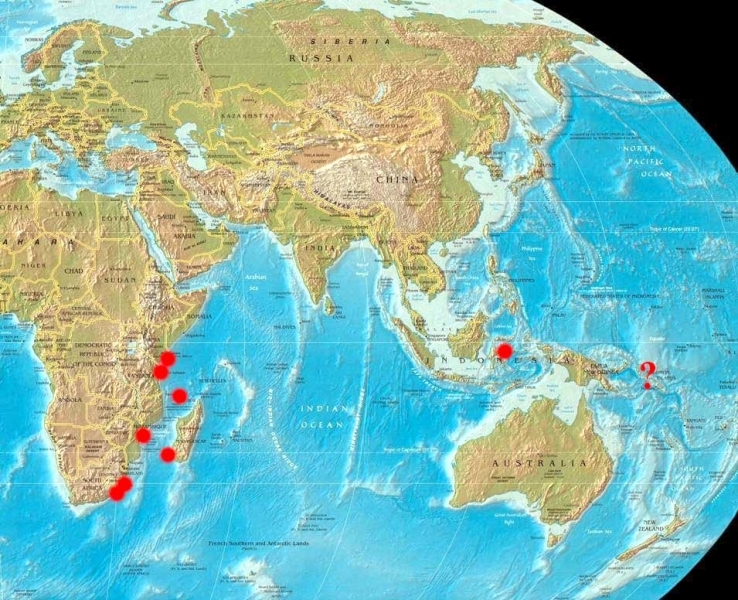 The Director of the East London Museum at the time was Marjorie Courtney-Latimer, who alerted the prominent South African ichthyologist Dr. Johnathan B. Smith to this amazing discovery after discovering it in a fish market. 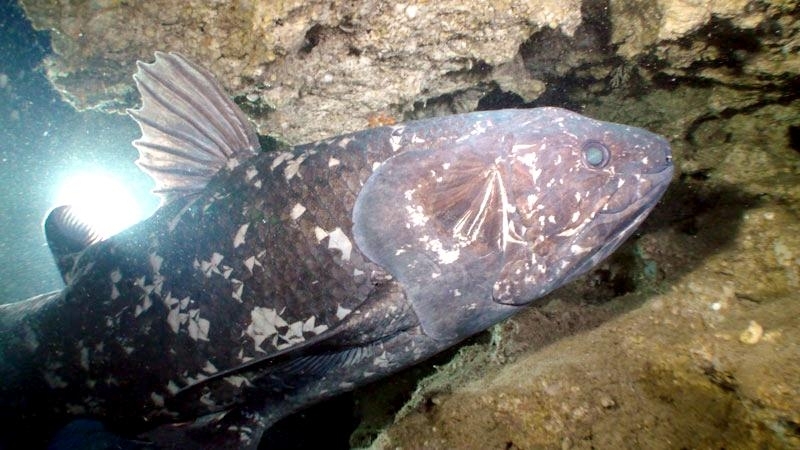 Their white scale flecks, set against a cobalt-blue body color offer excellent camouflage against the cave surfaces covered with white sponges & oyster shells. 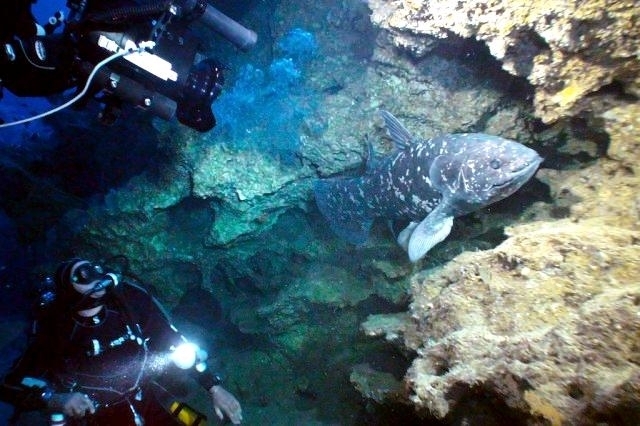 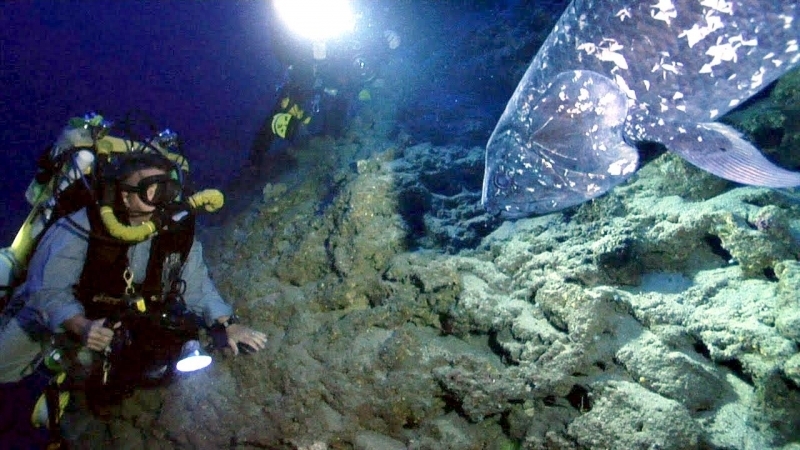 Fish which had been tagged with sonic devices were found to leave the caves at the same time late each afternoon to forage along the coastal incline during the night. 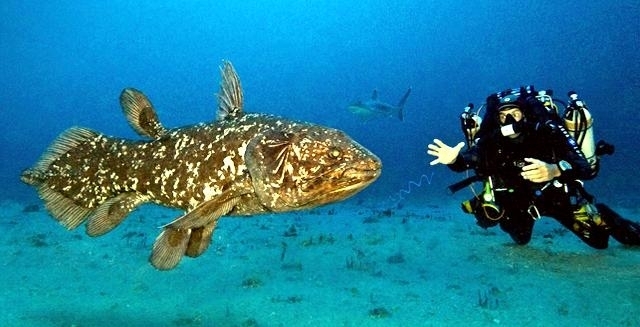 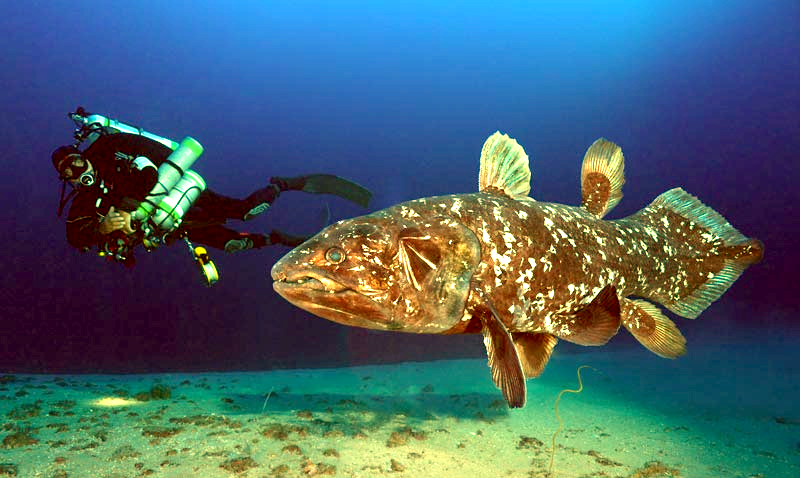 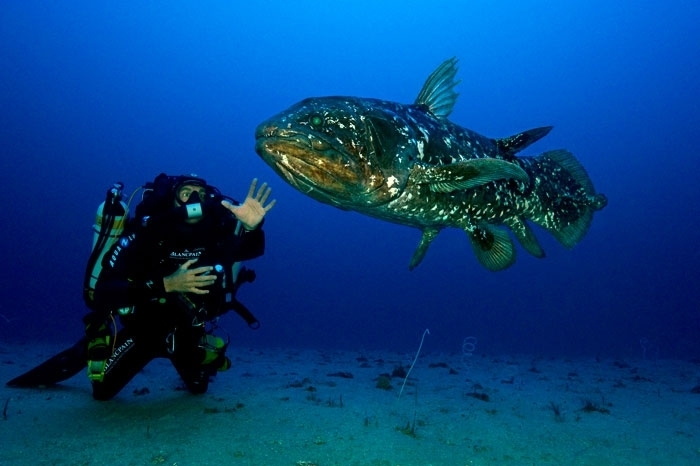 Today’s Coelacanths can reach almost 2 meters in length and weigh up to 68 kilograms. 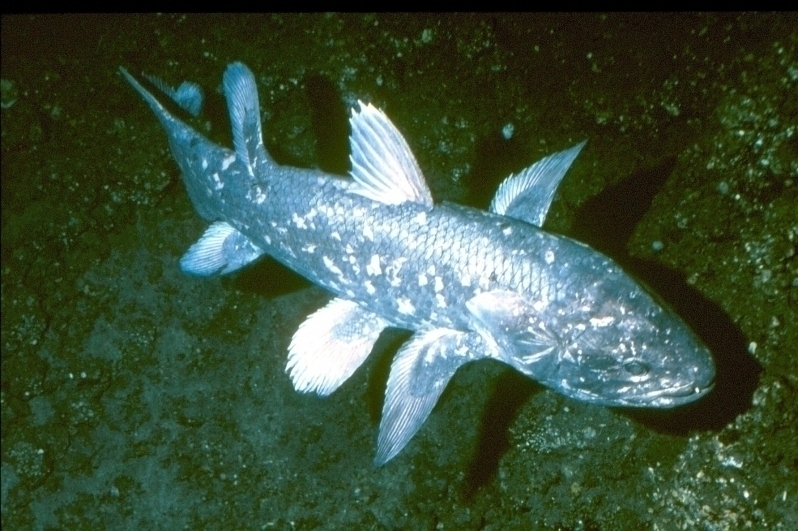 Coloration is dark blue with distinctive white flecks that can even be used by researchers to designate individuals. 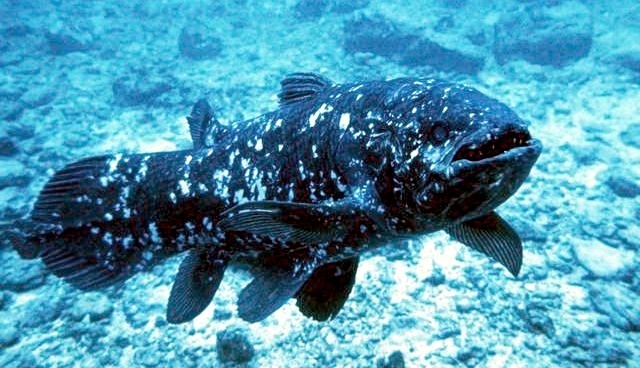 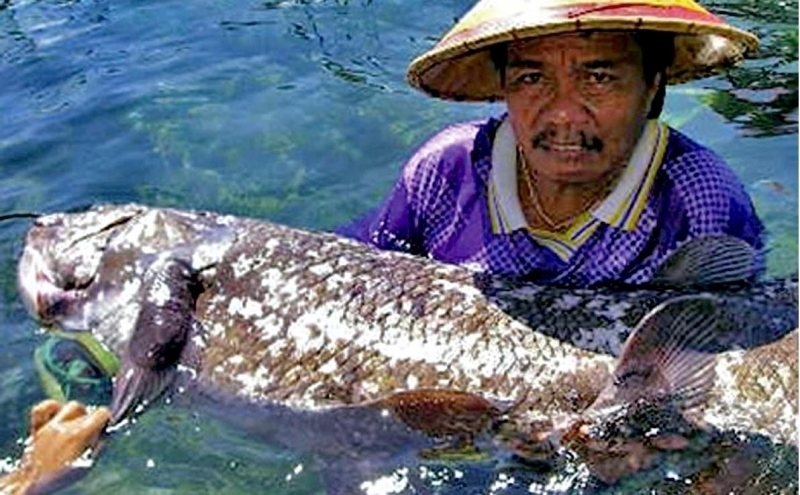 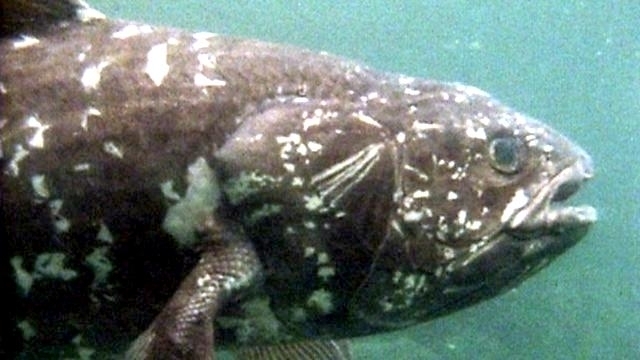 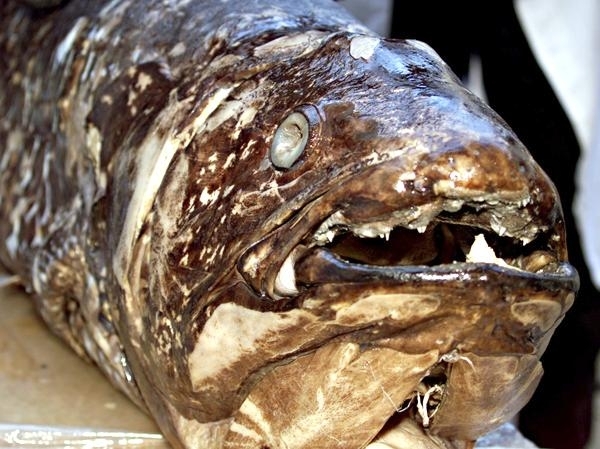 Scientists believe individual Coelacanths may live as long as 60 years. 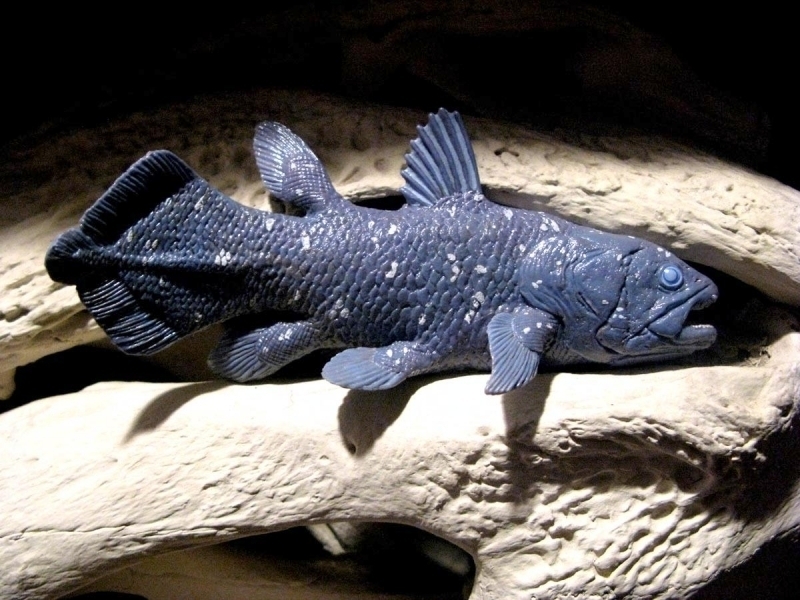 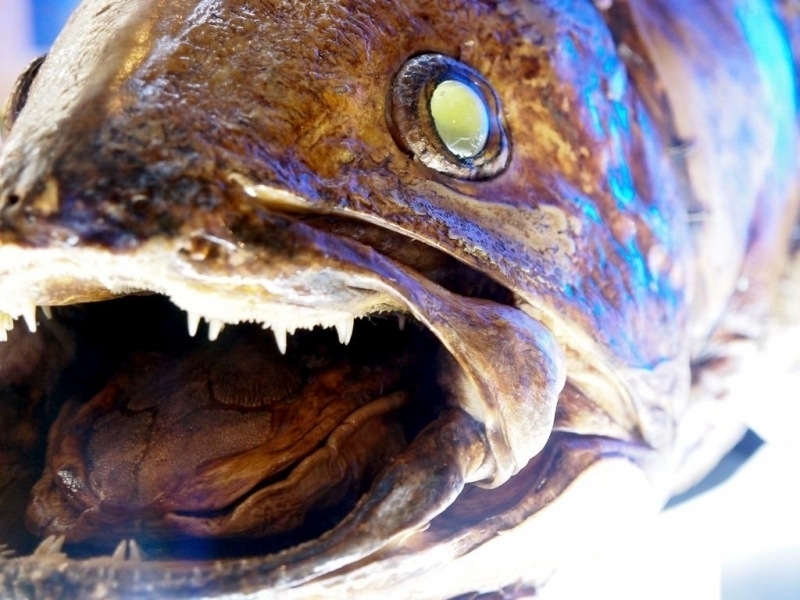 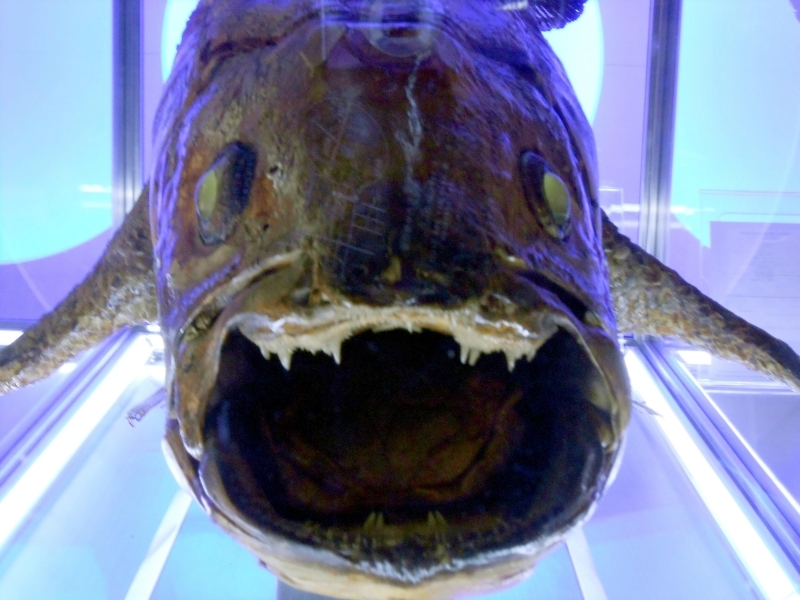 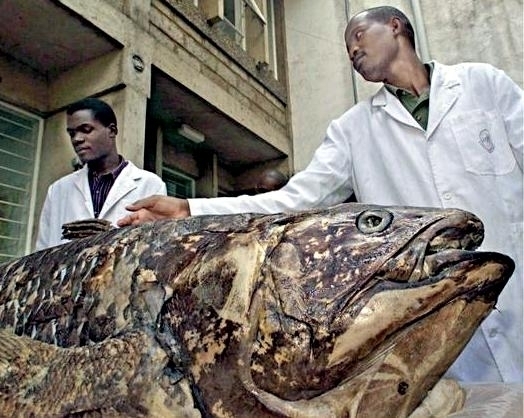 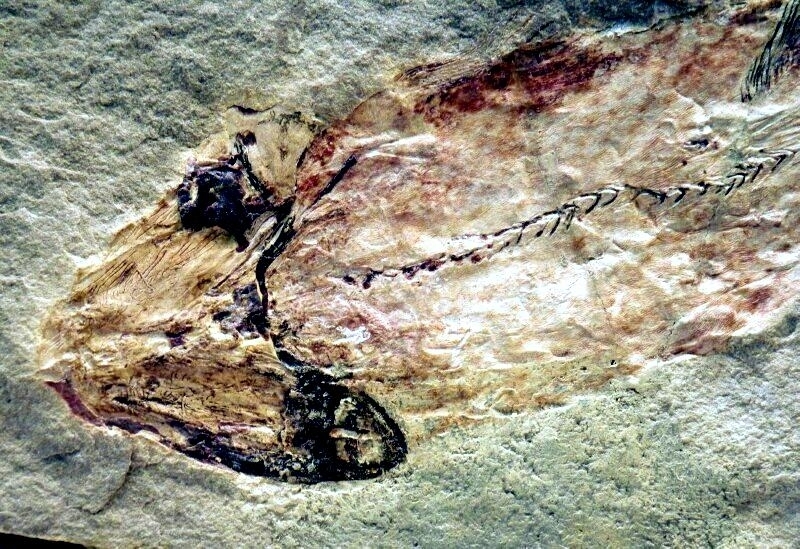 The Coelacanth appears to be a cousin of Eusthenopteron, the fish credited with growing legs and coming ashore 360 million years ago as the ancestor of all tetrapods (amphibians, reptiles and mammals) including ourselves. 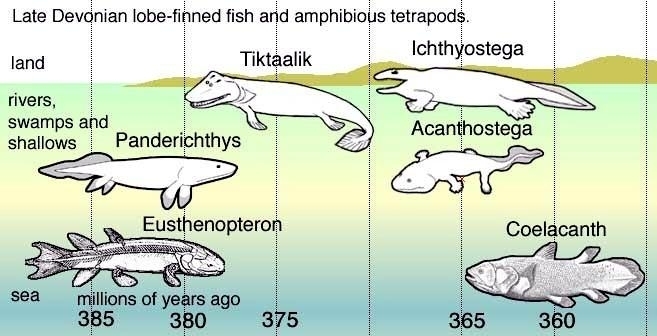 Debate still rages though as to whether the Coelacanths, presumed to be close relatives of the Rhipidistia fishes from which Tetrapod amphibians supposedly arose, are our closest Tetrapod ancestors or if lungfishes another very ancient line, are more closely related to tetrapods than the Rhipidistia. 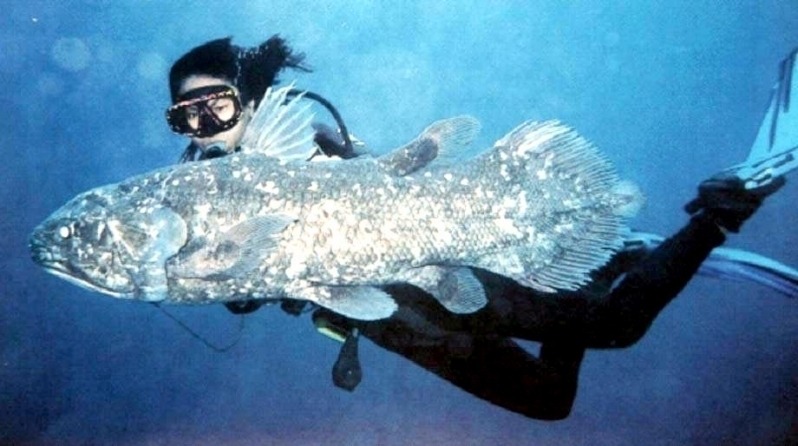 Coelacanths have a trilobated (three-lobed) tail with an extra trunk & fin protruding from the middle. 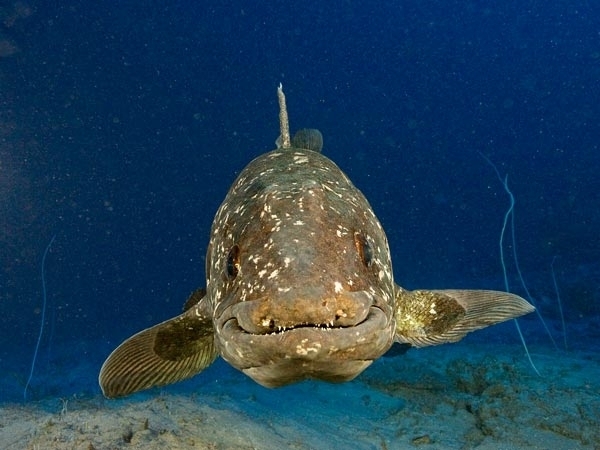 While the living Coelacanths retain many ancient features they have also contrary to their public image, done some evolving along the way like producing live young. 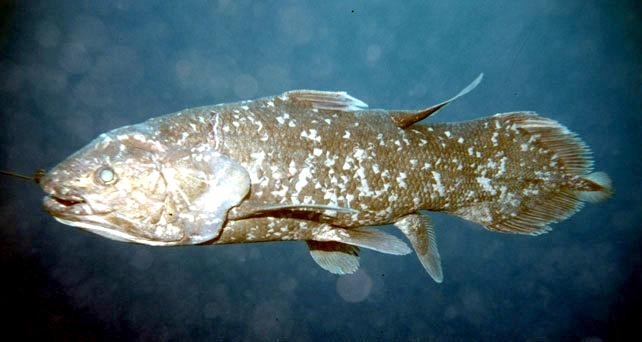 They are opportunistic feeders hunting cuttlefishes, squids, eels, small sharks and other fishes found in their deep reef & volcanic slope habitats. 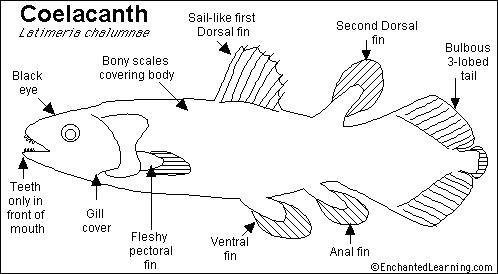 Location of prey fish is possibly aided by their rosteral organ (in the snout) acting as an electric field receptor. 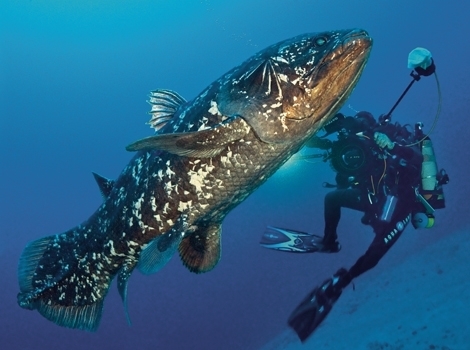 Coelacanths are also known to stand on its head, swims backwards and belly up to locate its prey presumably utilizing its rosteral gland. 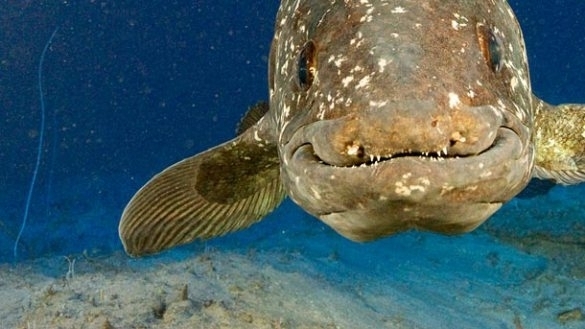 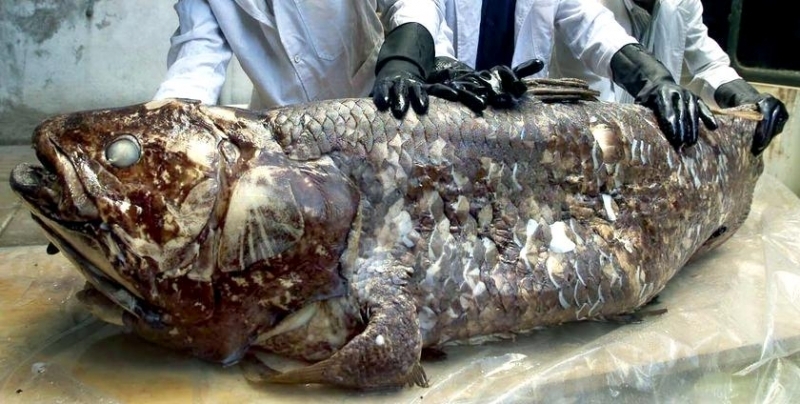 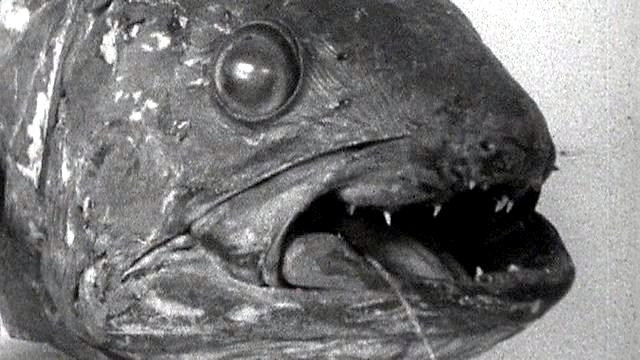 Scientists suspect that one reason Coelacanths have been so successful and also long-lived is that they can slow down their metabolisms at any time, sinking into the less-inhabited depths and minimizing their nutritional requirements in a sort of hibernation mode. 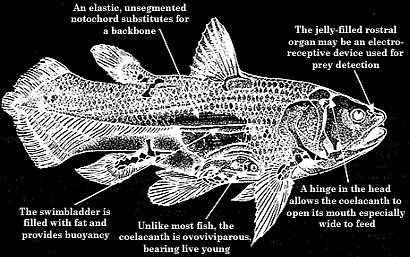 They are ovoviparous, giving birth to as many as 26 live pups which develop from eggs in the oviduct feeding off a large yolk sac until birth.